The Bob Leonard River Walkway is a project that was part of the St Charles Downtown Strategy Plan, the River Corridor Master Plan, and the Kane County Bike Plan which are guidelines used for the expansion and improvement of the Fox River as a public resource. Connecting 6.65 miles of riverfront pathways in St. Charles, it is part of an 85-mile network of walkways running along the Fox River and encompassing several communities. Completion of the walkway has been done in phases over many years with the installation of the statue, If I Could But Fly, in 2014 being the last major phase of this project. In order to improve the shoreline and build this walkway along the southwest shore of the Fox River in St. Charles, a crucial first step was gaining right-of-way permission from a private landowner for a central section. Bob Leonard was instrumental in achieving this permission and allowing the project to move forward and his work in obtaining this pivotal permission is one of the reasons the walkway bears his name. The first phase of the Bob Leonard Walkway, stabilizing the shoreline, was completed in 2007 using large riprap stone and stacked lannon stone ‘step’ walls. The inclusion of the stone walls not only improved aesthetics but allows easy access to the river’s edge and provide a sort of natural bench to sit and relax as you enjoy the views of the Fox River and scenic downtown St. Charles. Soon after completion, the stabilization was tested with flooding in August of 2007 and again in April of 2008. Success in protecting the Fox River shoreline from erosion with the stabilization was a critical first step and also improves the water quality of the river by reducing silt and sediment deposits. Phase two of the Walkway was building a bike and pedestrian pathway which extended from St. Charles’ Main Street south to the pedestrian bridge across the Fox River. The River Corridor Foundation of St. Charles, in cooperation with the City of St. Charles and the St. Charles Park District, extended the river walk path on the west bank of the Fox River in St. Charles. The Extension of the Bob Leonard Walkway from the existing Indiana Street pedestrian bridge, south to Mt. St Mary’s Park on the south side of the Prairie Street Bridge connects the park to the downtown area. This phase of the walkway project involved stabilization of the riverbank and extensive engineering work to ensure it would meet environmental and regulatory requirements. Between the Bob Leonard Walkway and Mount St. Mary Park were some existing paths which were incorporated into the extension and set with brick pavers and landscaped to match the rest of the Walkway. Now a beautiful, continuous river path exists to tie together a major section of the Fox River Corridor. 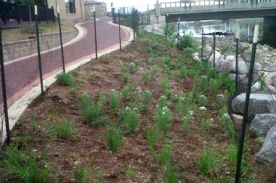 The City of St. Charles and the River Corridor Foundation formed a unique contractual relationship to improve and maintain the landscaping and overall appearance of a highly visible portion of the Fox River bank in downtown St. Charles when new plants were installed along the Bob Leonard Walkway to improve aesthetics and to help reduce erosion along the Fox River shoreline. With funding supplied by the River Corridor Foundation, a company was hired to create and install a landscape design incorporating native plants along the eastern edge of the Bob Leonard Walkway. Unique to the contract between the City of St. Charles and the River Corridor Foundation was a commitment to provide stewardship for a period of six years following the original installation. This time frame was chosen because native plants require a 5 to 6 year period to become fully established to be able to withstand the types of floods that are common along the Fox River. A critical element of the contract with the landscaping company was the inclusion of a three-year maintenance agreement, which also involved a training component to train and educate volunteers to take over the stewardship. The Pottawatomie Garden Club accepted this maintaining the plantings for the additional three years to allow the plants to become established.